Healing is seeing the truth, and knowing you made the best choice you could. Healing is the transformation of pain into acceptance, and suffering into beauty. Healing is the calm after the destructive storm within, and that is mirrored without. Healing is breaking into a million pieces, then coming back together consciously in a new way. Healing is loving when you have no love left to give. “This is what time is” ~ Messages from spirit. I received an important message about her immanent crossing just a few weeks before, one that I will forever be able to call upon to find peace in times of grief and loss. As such, the passing of my beloved maternal grandmother one month ago was not as much of a shock to me as it was to the rest of my family. There is a special connection to one’s maternal grandmother. After all, a piece of yourself was created within her as well while your own mother was being created. I visited with her before she passed. That day she was laughing and bouncing her great-grandchild on her knee. My cousin’s 8 month old was the light of her life, and whenever we tried to take a picture with them together she could hardly look at the camera as she was so focused on him with sparkles in her eyes. She always said “all I want is to live to see one great grandchild!” She did; her life’s wishes were complete. Two nights later and a few months shy of her 92nd birthday, my always elegant grandmother took off her Order of Canada pin that she wore every day, put her eye-mask on, went to bed – and didn’t wake up. My Tata was no ordinary senior citizen. She was a trailblazing and inspirational award-winning Canadian fashion visionary whose career and legacy is documented in the website I made for her several years ago, and have updated since her crossing. There are things I always expect to hear from a new reader: “Wow you are going to live a looong time!…You were meant to be your own boss…no health issues…I see you also have some psychic ability, why aren’t you using it more? You must meditate more to strengthen your connection.” Agreed. Of course these are things that have always been known to me, but it is always nice to hear again. Some may argue those things could be said to anyone and so-called spiritual readings are nothing but entertainment. But after years of hearing certain points in varying detail, there are things I no longer question. “You must understand, that what is coming is not sad, it is natural. It is not sad. This is what time is, and you need to know that.” The space after the words was a space of understanding and acceptance within my soul. This message was not from this woman but from time itself. I nodded, it was felt, and I did not ask her which grandmother time would be coming for. I filed that message away at the back of my consciousness. Why worry? It was going to happen eventually wasn’t it? Eventually arrived only two short weeks later, and the words were there to comfort immediately when I heard the news – It is not sad, it is natural. This is what time is. In that moment I almost wished I had asked which grandmother, but what could I have done had I asked? What more was there to share through a message so clear, one meant to relieve my own sadness and offer deeper understanding for anyone I could share the message with. Had I insisted on knowing I would have been fearful and perhaps instilled fear in others. This message was not about fear, it was about acceptance, and a lesson not soon forgotten about our connection to time. My Grandmother’s crossing was aligned with how she lived her life, a life following her passion without fear and without regrets. My Tata was a truly positive and genuine soul, a perfect example of a life well lived and well loved by many. She chose not to suffer her own emotional issues in life, she was generous and patient, and at 92 with no illness other than arthritis, healthy and not a day in the hospital, death came to her without suffering. The sudden loss of a beloved family matriarch was sad for all of us, but she had not only lived a good life realizing all her dreams and goals filled with love and compassion for everyone she met including herself, time had honoured her in the most beautiful of ways and had blessed her with a graceful and easeful exit. An angel’s death as they say in Arabic. The egg from your mother that made you was already formed all inside one being, your grandmother. Even with her busy career, my grandmother took special care and time in helping raise us. I was also blessed enough to also have her mother, my great grandmother in my life until almost her 100th birthday and my 20th. So many creative forces were passed to me from my grandmothers, and I am grateful beyond words for those gifts and for the love I feel they continue to give us. I am grateful for the gift of time and longevity that my spirit through them has also been granted to walk this earth, to have known such a dynamic and vibrant spirit, and to be blessed to call her my Tata. Time is the birthing of a new clean and unburdened moment. Time is the gatekeeper of ever unfolding limitless possibilities. It is the gift of spaciousness, it is the rhythm of the breath of the universe. Time is not our enemy, and to attempt to race to beat it is to hold one’s breath as if to gain greater momentum. To resent it is to deny the life spring of truth and understanding available to us, and to wish for its folding backwards or forwards is to rob us of the experience of expansion. Envision arriving by boat to the shores of a beautiful Ayahuasca medicine retreat center in the Peruvian jungle, where your guesthouses are tree-houses within the ancient trees. Curandeiro Maria Garnet and her partners are building just that, a sacred space where you can go to meet with what is known as the grandmother medicine, learn and heal in a safe environment, and with confidence in a highly skilled, caring, and dedicated team. Ayahuasca is a brew traditionally made from the Banisteriopsis Caapi vine combined with one or more plants native to the Amazon Rainforest. The tea has been used for millenia for spiritual healing by indigenous tribes of Amazonia. Canto Luz retreat center is in the process of being built, and Mariya is currently visiting Eastern Canada on her journey promoting her indie-gogo fundraising campaign for building this centre on land that has been offered to her and her teachers for this vision. You are invited to follow the story of its construction on the Canto Luz blog Living with the Trees. If you are in Toronto and can’t make it to Peru anytime soon to help with construction, consider attending her free talk : “Amazonian Tradition, Shamanic Training, & Sustainability of the Forest” Presented by Evolver Toronto, at Alternative Thinking Bookstore in downtown Toronto (Bathurst and Bloor) this coming Monday March 4th, 2013 at 7pm. Vsit the FB event page. Inspired by the culture and my years of playing Batucada in Montreal (Brazilian drumcore), In 2005 I decided I was going to visit Brazil on my own for the first time. Upon arriving I played batucada in a bloco in carnival Salvador, I learned Portuguese, and then returned several times and stayed many months to a year. I was first introduced to Ayahuasca medicine there, and have since been working with this medicine regularly. While in Brazil, I attended ceremonies of the Uniao do Vegetal, a christian based sacred medicine group similar to the Santo Dime. When I discovered Mariya’s work, I knew I had found a home for this path. Mariya’s traditional Peruvian ceremonies are unlike any I had attended previously, and have become my most trusted source for this healing journey. I have never felt so much unique care and dedicated practice, and having a woman medicine worker has greatly increased my trust and comfortability with this intimate healing process. Mariya gathers, cooks, and prepares all her own medicine for several days with her teachers on the land in Peru, unlike many medicine workers practicing in North America who often simply order their brew from potentially unknown and un-guaranteed sources. I am looking forward to supporting and visiting Canto Luz, and to working with Mariya and this sacred brew in the future. My recent trip to Palestine and Isreal was a great source of Inspiration, love, and family connection. Born in Toronto, Canada, I have always distanced myself from a Palestinian heritage and land conflict that felt foreign and overwhelming. My spirit chose to flourish in a different place after all, and although I speak three languages I never learned Arabic, a great divide in understanding the culture. Acknowledging my lineage was a missing link in my life’s path, and I am grateful I was blessed with the freedom and means to take that leap. Today is the day I fly away, to the distant Middle Eastern lands of my family’s origins and my fathers birth. Jerusalem no less, the holy city. When was the last time you have been “back home” they say. Back home? You mean Canada my birthplace? What is “back home” to a land filled with war and turmoil I never knew, and a grandmother and family I have not seen in 18 years. A good family they always say, a very good family. The land of milk and honey, oh so sweet on my lips…..
Today I am back in the familiar wintry wonderland that has cradled me throughout my life, and I only now have accepted, that I have always missed you. You have taken me on a pilgrimage to the profound depths of your valleys and the soaring heights of your hills. I heard your emotive timeless singing and danced your ecstatic deep rhythms. A land whose bounty yields feasts topped with roasted pine nuts, olive oil, and fresh lemon. A land so sweet many have gone mad wishing to posses you, and your rivers run dry as your tears continue to fall into the sky. Your eternal forgiveness and compassion inspires a way of loving only you could have shown me. It’s my favourite time of year, when elves and faeries scamper out to the forest for Solstice festival to dance their hearts out on the longest day of the year as we have done for millenia. June 18-24, 2012, you can find me there. 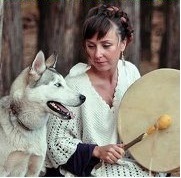 The OM Reunion Project annual solstice celebration isn’t like any other Summer Music event. As a membership based, community driven event, it is up to YOU to create the experience you want to have, and share with those around you. The Center for Alternative Living Medicine (C.A.L.M) is the gathering’s holistic haven where community members can access natural healing alternatives in a peaceful and safe environment. Come by anytime and find experienced body-workers available. Massage therapists, Reiki and energy therapy practitioners, acupuncturists, reflexologysts, craniosacral therapists, osteopaths, tarot readers, sound healers, hypnotists, meditation teachers, shiatsu practitioners, shamanic medicine practitioners all available free as part of your membership fee. Its my fourth year volounteering at the festival and my third year as the C.A.L.M coordinator. My first OM reunion project solstice festival in 2009 we were only 6 practitioners for the whole week, and this year for our largest gathering yet, we have an unexpected 40 volunteer alternative healthcare practitioners already confirmed available to festival goers. How will I coordinate enough massage tables and space in our limited shelters to house them all! It will all work out as it should, trust in the universe. Perhaps next year you will consider attending. See you when I return from the forest…. If you are looking for a skilled Acupuncturist with reasonable rates, Traditional Chinese Medicine practitioner Lorena Meillon practices from my sunny healing studio on Wednesdays. Please visit www.dynamicbeingtoronto.com for more information on the services provided and to book an appointment. At Dynamic Being we offer various Traditional Chinese Medicine treatment modalities that, when customized to your needs, will help you reach your goal towards optimal health. 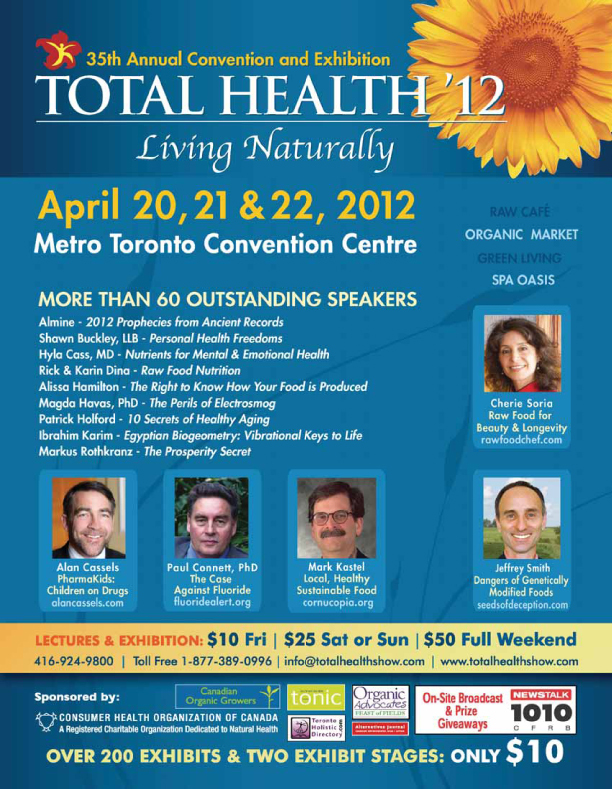 One of my favourite heath and wellness events in Toronto is coming up this April 2012. The Total Health show happens each spring at the Metro Toronto Convention Center downtown. With the Skywalk from Union station, its easy to get to and lots of fun. I always meet amazing people, discover new healing techniques, and sample health food tastings galore! Check out the exhibitor list, workshops, and speakers. Plan to spend at least half a day perusing the stalls. Entrance is only $10 for the exhibit floor, and you can hear some speakers there as well. One $10 floor pass is good for all three days, passes can also be shared with others to be used on different days. Featured presentations are in the conference hall and cost extra.